As of August 2015, the National Park Service has designated a new National Landmark in Jefferson County, bringing our total to two illustrious, nationally recognized sites. Secretary of Interior Sally Jewell signed this designation, bringing a decade-long process to a close. The park represents a rare and outstanding example of New Deal work in collaboration with local government to develop public landscapes and outdoor recreation. Read more about this national landmark. 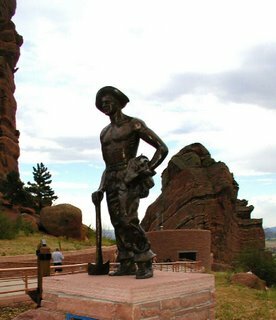 We anticipate this will be celebrated with a plaque and dedication in 2016, in conjunction with the 75th anniversary of the completion of Red Rocks Amphitheatre. 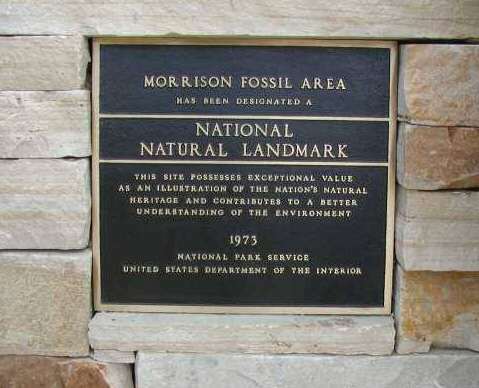 Plaque for Morrison Fossil Area National Natural Landmark, designated 1973. With the recent expansion to 84 acres, this significant paleontological site now includes three track sites near Golden, in addition to two original dinosaur quarry sites north of Morrison. It is one of 14 National Natural Landmarks in Colorado. Visit our page on this monument. National Landmarks are a much more prestigious and exclusive designation and the nomination process is more detailed. The landmarked properties must have national significance beyond their basic historical or natural values. In contrast, National Register listing is a process for recognizing sites that are usually at least 50 years old, and are significant according to listing criteria, including things like their association with historic people, events, etc. Colorado has more than 1400 sites, buildings, and districts listed on the National Register, but only 25 National Historic Landmarks and 14 National Natural Landmarks.